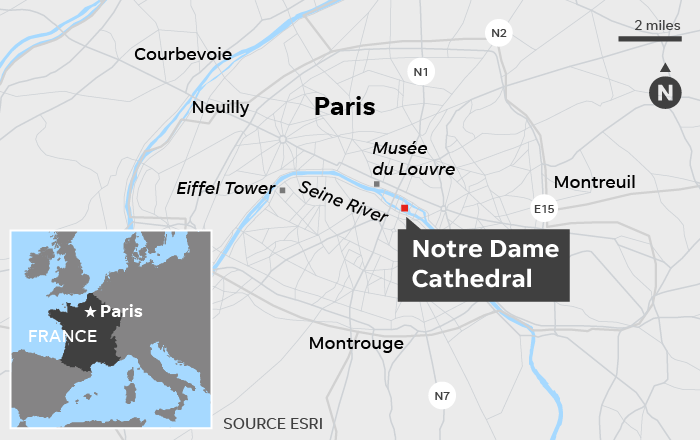 A massive fire was raging Monday at the famed Notre Dame cathedral in Paris as shocked crowds gathered on local streets and squares to watch one of the globe’s most iconic churches burn. The cathedral’s spire was engulfed in flames before tumbling over. Video footage from the scene showed fire and smoke spewing from the landmark, one of the world’s most popular tourist destinations. The flames appeared to be shooting out of the roof behind the nave of the cathedral. Officials, tourists and locals took to social media to document the blaze. French President Emmanuel Macron postponed a televised speech to the nation Monday evening because of the blaze. The cathedral dates back almost 1,000 years. Its construction began in the 12th century, and it took about 300 years to complete. The result is that, although it is predominantly French Gothic, there are areas that reflect the Renaissance and the Naturalism era of construction.